During the event, if players are online for a total of 1 hour in a day, then they will each obtain Serpent Stone Fragment*150 and Garnet Fragment * 1000 . Blackbeard, the nefarious and audacious pirate, shall never sink anymore of the Royal Navy! The government has offered a generous reward to anyone who captures this nefarious outlaw, dead or alive. During the event, the government's secret envoys will be stationed at Maderia Port (-156 -57). 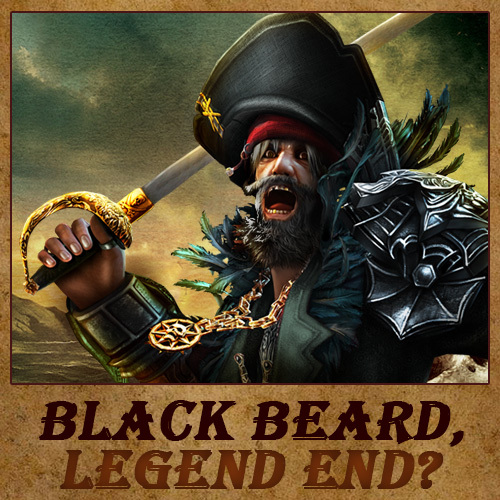 Speak to Slaughter City Messenger and he will lead you to the legend of the seven seas - Blackbeard! Simply sink his vessel, and the government will reward players according to their damage contributions. The system will send all rewards to the Prize Taking section. 1.Once Blackbeard's vessel is sunk, you shall be duly rewarded! The top 100 captains, based on their damage contributions, will be rewarded accordingly. 2.But if you flee from or get sunk in battle, your damage contribution will be reset to zero. 3.The area is arena rule. IGG reserves the final interpretation and right of the event.